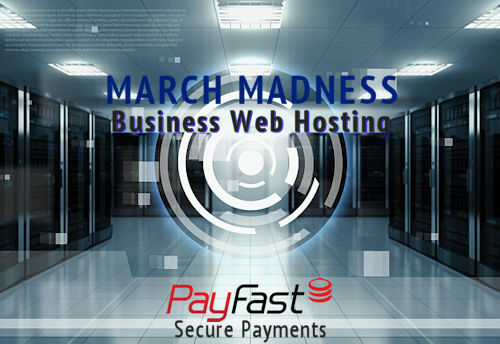 Our March Madness Sale is on - Get an Amazing Web Hosting Deal. Get 66% OFF your first year with our Annual Business Web Hosting Plan. Only 30 Spots Available - Act NOW! Our Business Web Hosting Plan is suitable for most small to medium sized businesses. It is the perfect hosting plan for your Personal or Business Website and/or Blog. Powered by Linux OS on a Shared-Server, located in a Tier-1 Data-Centre in Johannesburg. We offer 24/7/365 Server Monitoring and a 99.8% Up-time Guarantee. IMPORTANT: After payment you will be redirected to an Online Form to submit your Order Details (ie. personal & domain name info etc). Before we process the details of this form, we may require further manual interaction via email or telephone. Note: Renews annually at current plan pricing. 1.2. Promotion available to New Customers Only and applies to both Online and Direct Sales. 1.2.1. Should an existing customer wish to take advantage of the March Madness Promotion, he/she is welcome to subscribe with a new account and new domain name. Domains or Accounts already hosted by FuturityWEB do not qualify. 1.2.2. No existing Accounts / Domains may be cancelled and re-enabled making use of this Special Offer unless such Domain/Account has been off our system for a period of no less than 24-months. 1.3. Migrations from existing hosting accounts or special offers are not permitted. 1.4. Standard termination rules apply for existing services. 1.5. Promotion period is between 00:01 on March 1st and 23:59 on March 31st Annually. 1.7. The sign up date is the date upon which the special offer is purchased. 1.9. The annual renewal fee amount is determined by Payfast per the date of signing up. 1.10. The annual renewal fee includes 12-months renewed Hosting Services and annual .co.za domain renewal. 2.2. All Transactions for this Special Offer are to be completed using PayFast our chosen secure online payment gateway. 2.3. After payment all new customers will need to complete an Online Sign-up Form providing us with the necessary information to setup your account. Since this is a manual action 24-48 Hours may be required. 2.4. Once the process is complete, your Web Hosting Contol Panel Login Details will be forwarded to the provided email address per the Sign-up Form. We may also contact you telephonically. 2.5.Offer excludes cPanel Configuration and setting up of email address unless migrated from another provider. 2.7. Subject to FuturityWEB Acceptable Use Policy. 2.8. Should any stipulation contained within the general Terms and Conditions conflict with this document, the provisions of this document take precedence. 3.1. This promotional offer is valid for new clients/domains only. 3.2. Existing FuturityWEB customers are eligible for this promotional offer, but cannot migrate their existing Domains or cPanel Accounts to this promotional product. 3.3. Subscribers should have an existing domain to migrate to this service or they should register a new .co.za domain to enable this service. 3.4. Should a Customer terminate the promotional service at any time after registration/migration of their domain name, a refund of R80 may be refunded at our discretion. The remaining R150 is withheld to cover the costs of Domain Registration and/or Migration. 3.5. Account terminations prior to domain registration and/or migration will get a full refund, less 5% handling fee and/or admin fee. 3.6. All March Madness Promotional Offers run from 1st March of the current year to 31st March of the following year with payment in full at our standard rate being billed on 1st April for the consecutive year. 3.7. Consecutive year(s) payments at our full rate are subject to pro-rata adjustments in the case where early termination/cancellation is required. Don't Worry this deal comes back every year in March.